Edna H. Smith was living in Sutter Creek, Amador County, California with her mother, Mary E. Smith and siblings William and May when the 1880 census was taken. Edna Henrietta Smith was married 23 July 1896, Placer County, California to Chas. Howard Norton. She and Charles we located in Sutter Creek, Amador County, California in the 1900 and 1910 census’. Edna died 17 October 1914 in Sutter Creek, California. Edna Smith Norton was buried in the Sutter Creek City Cemetery, Sutter Creek, California. #T9, roll #63; citing Family History Library (FHL) film no. 1,254,063. 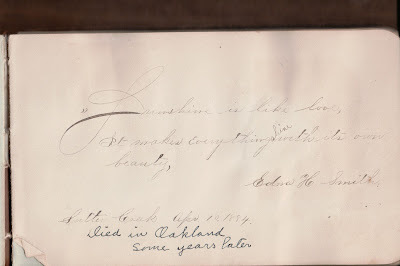 "California County Marriages, 1850 to 1952," database, FamilySearch.org (www.familysearch.org: accessed 30 Aug 2015), entry for Chas. Howard Norton – Edna Henrietta Smith, 23 July 1896, Placer County; citing original marriage records housed in the clerks’ offices of the district courts in various counties throughout California. “California Death Index, 1905-1939,” database, Ancestry.com (www.ancestry.com : accessed 30 Aug 2015), entry for Edna S. Norton, 17 Oct 1914, Amador County; citing original death records, California Department of Health Services, Center for Health Statistics, Sacramento. Find A Grave, Inc., Find A Grave, database (http://www.findagrave.com : accessed 30 Aug 2015), entry for Edna Smith Norton (1860-1914), Memorial No. 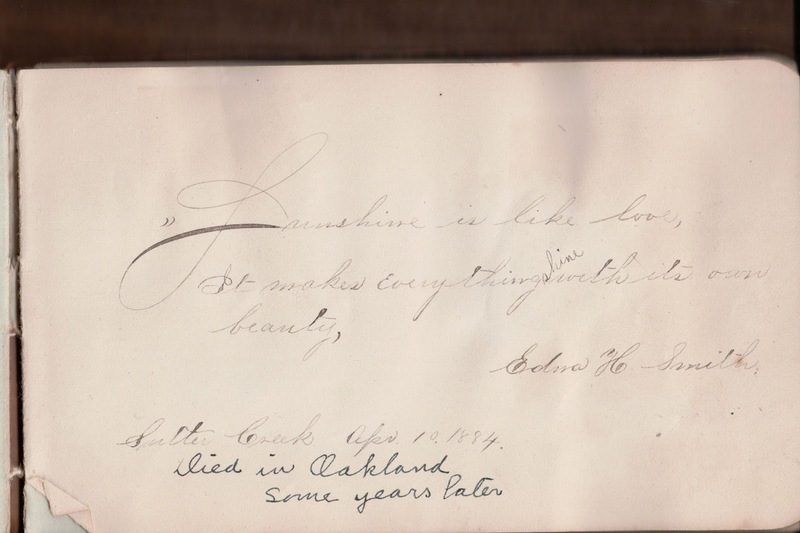 26078738, Records of the Sutter Creek City Cemetery, Sutter Creek, California; page created by Ancestry Seeker, 16 Apr 2008.